In the past, we&apos;ve all been focused on getting our whites whiter, but now the Earthwise team have come out with a product to help your blacks stay blacker. So why have Earthwise developed this new product and how will it help? Black Wash has been specially formulated for black and dark coloured clothing, so that means it has an extra gentle action to avoid stripping out coloured dyes. Black Wash also has no bleaching agents or optical whiteners but it does include a special ingredient called an anti-deposition agent. An anti-deposition agent prevents light coloured soils, water hardener, or minerals (which tend to be white-ish in colour) being deposited on fabrics, giving the impression of greying or colour fade. Clever stuff! Earthwise Black Wash is grey water and septic tank safe. It contains biodegradable surfectants. When 3/4 of your wardrobe is black you need something reliable to not only clean them but also not strip the colour out of them at each and every wash. I have to admit I was extremely skeptical about this product when it first arrived and really held little hope for it&apos;s performance, however I was pleasantly surprised. After loading up a full load of dark items into our front loader (love that this product is suitable for both top and front loading washing machines) I filled the appropriate cell in the machine and hit START - did I mention it is also suitable for septic tank usage which is a big tick for us rural folk. Of course good things take time so occupied myself for the mandatory 90minute cycle before heading for the beep. On first inspection it was hard to really note any real difference, I mean it&apos;s not suddenly as if everything is now pitch black and renewed to it&apos;s former glory, but after drying it was clear that the colour appeared to have been retained namely in a pair of fairly new black jeans which week on week have unfortunately been losing it&apos;s deep black colour - the fading was not as apparent and the colour ready did appear to be maintained. First impressions were good, but after continued use on our dark&apos;s it could be one of those "darker darks" type laundry wins. I am overall happy and best of all even on Master 4&apos;s clothes it hasn&apos;t been causing any skin irritation which he often gets from a number of products - win win for this product. 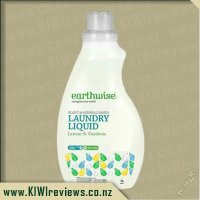 Well I am already a converted Earthwise product user and pretty much every possible product in my house is Earthwise so I didn&apos;t take any convincing to try the new Black Wash laundry liquid. I am a bit OTT on doing all my laundry in separate loads and keep my whites separate from my coloreds and my blacks separate from everything so having a Black Laundry wash liquid just seemed completely logical and "why has this only been invented now"? I wear a lot of black and am lost without my black leggings but I do notice that they fade much quicker than they wear out and its amazing how different leggings are after a few washes compared to the dark black of brand new. I was really keen to find out if using the Black Wash Liquid would make a difference. Obviously to truly test this out I needed to go buy a few pairs of new black leggings to compare with my old worn pairs and my girls have compulsory black shorts as well as all the other random black t shirts and socks etc that we go through in a week so we had lots of items to test this Black Wash liquid on. This Black laundry wash can be used on black and dark clothing so I have deemed it okay to use on all our navy items like school socks, jeans etc as well. I have been using this for about six weeks now and I have to say that I do think it has made a difference to the longevity of my black and dark items. They haven&apos;t yet faded and those items that were a bit faded haven&apos;t faded more. I will continue to use this product as it will be interesting to see as the year progresses whether my black leggings especially don&apos;t fade like my old ones but I am pleasantly optimistic. As with other Earthwise Laundry liquids (and all Earthwise products) this is super great from children with sensitive skin and fine for using with grey water and septic tank systems. 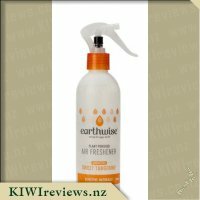 Another brilliant product from Earthwise that I can definitely recommend trying. Oh BABY... where have you been all my life?! This is the stuff I have been hoping existed since I started wearing pretty-much-all black clothes back in Uni. As a laundry liquid, it does an excellent job of getting my clothes clean, leaving them smelling washed and fresh, and free from those annoying powder-stains caused by washing powders that clump and don&apos;t fully dissolve, leaving white residue behind on your clothes in... shall we say... awkward locations on black trousers. Locations that cause a male to quietly shove them in the machine back for a hot rinse cycle or three. But how to test the hype about fade resistance? Simple! I bought two identical black shirts, one I washed ONLY in the regular laundry liquid, and the other I washed only in this liquid. They were washed the same number of times, on the same days, hung in the sun for the same period of time each time, worn exactly once before going back into the wash cycle... rinse and repeat for 6 weeks. As you can see from the photo linked to the review, the difference is astounding! Not that I think it needs explaining, but the shirt on the left is the "regular wash" shirt, while the shirt on the right was the one that got only the Earthwise treatment... and I can&apos;t believe just what a difference it has made. To look at the shirts individually, I couldn&apos;t really see a lot of difference, but when hung side by side, the depth of darkness retained by the second shirt is striking. Overall, this is my new go-to laundry liquid. I&apos;m not even fussed about the price tag - if it can extend the crisp blackness of my clothing even over this short amount of time, then it&apos;s worth whatever the price tag is in my books! I&apos;m not sure what planet I have been living on, but I seem to be one of the very few people who never knew that a black wash existed! I wear a lot of black, and my work uniform includes a black polo shirt so having a black wash would certainly come in handy in my household. I hate nothing worse than when a nice black item of clothing looses the black and becomes more of a grey blue colour. I have one favourite piece of clothing in particular - a black long sleeve shrug - that is now more grey than it is black. I only wish I had discovered this product before it got as bad as it is! Having only two weeks to test this product I cannot comment on whether it stops black clothing losing its colour over time, but I can comment on how lovely it was to use. I usually use a powder in my washing, but it can be a bit hit and miss as to whether all of the powder gets dissolved or whether you end up with white marks on your clothing. I did like that this was a liquid, as this certainly wasn&apos;t something I had to worry about. Upon opening the lid I was met with a nice, floral type smell. Nothing too out of the ordinary when it comes to laundry powders/liquids. The liquid itself is quite thick so I did have to hold the wee lid up a little bit to let it all run out. The lid is fantastic for being able to measure the liquid, although the only downfall is that being black it is hard to tell exactly how much you have but a little extra or little less isn&apos;t going to make too much of a difference. After my clothes had been washed and dried I decided to see just how they smelt. Some products I have used in the past make your clothes smell quite strong. I am not a huge fan of floral smells as I am a big hay fever sufferer, plus I&apos;d prefer my clothing to smell neutral rather than smell like laundry powder. The smell of the liquid is quite strong, however the small amount you use in a whole wash means that the clothes certainly don&apos;t smell too strong. They came out smelling nice and fresh and there was nothing that set my hayfever off. I find the bottle quite appealing. A clear bottle with black writing and lid, and a single stripe of bright pink with the word "New" through it. The pink just catches your eye and would certainly make the bottle stand out on a shelf for me. The writing on the back is on the smaller side, luckily for me I have no issues with vision so I can read it easily, but others may struggle. The instructions on how to use are very clear and easy to follow. This will certainly become a regular product in our laundry and I look forward to seeing what a difference it makes to my black clothes over a longer period of time. Years ago I used to use a black washing liquid by another brand which I constantly used as the majority of my clothes were black or dark colours. But alas, they stopped making it (or supplying it to my local supermarket) and I had to go back to powder. 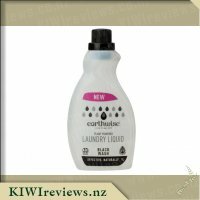 My excitement escalated when I saw the Earthwise Laundry Liquid Black Wash being offered and I had to try it! A lot of my own clothes are still black or dark, and with my husbands work uniform consisting of black gym pants, and our daughters school uniform navy blue, I was set to put it to the test. A smooth texture with just the right flowing consistency which made it easy to pour and put into the dispenser, but not too thick that it stuck in the lid. I&apos;m constantly rewashing clothes after having them go a normal wash with powder because of white marks being left behind. Having already do at least one wash a day for clothes, I don&apos;t want to have to do more! Our washing machine has no agitator and although it&apos;s great for getting more items into the drum, it does mean that there is nothing for the clothes to rub up against. So powder often gets clogged up. The liquid does not have this problem at all, and runs smoothly through all the clothes, even in cold wash. And once the wash cycle finished, the clothes were left with a delicious lingering smell that stayed as the clothes dried. I look forward to continual use of the Earthwise Laundry Liquid Black Wash and see how little fading our clothes get. We already love the Earthwise Baby Laundry Liquid so don&apos;t have any hesitation on using this for every day washing. I love the eco brand that Earthwise has, and how it&apos;s gentler on the environment than other options on the supermarket shelves. At around $7 for a bottle of 33 washes, at only $0.21 a wash it is so economical! And with a 1 year old in our house, it&apos;s gentle on the skin as well as the clothes. My wardrobe consists of clothes that are 95% black so I was hoping that this would be the perfect washing liquid for me! I have a front loader and I prefer to use liquids as it is not only better for my machine but liquids don&apos;t leave any white smears over my clothes which is a major bonus! 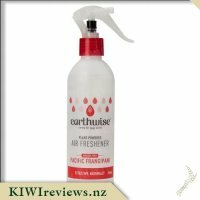 I also like using Earthwise products as they are not only made in New Zealand but are free from phosphate, nitrate, chlorine and ammonia. It is also grey water and septic tank safe, great if you&apos;re living rurally! The Earthwise Black Wash liquid was quite thick and had a lovely fragrance. The 1 litre bottle says it does 33 washes which makes it quite economical although I&apos;m not sure I got 33 washes out of the bottle! Nevertheless, I found that when my clothes came out of the washing machine, they smelt lovely and had no white smears. I found that my dark clothes retained their colour and hadn&apos;t faded as badly as they had with standard washing liquids. To be honest, after using this liquid, I feel like dying all my clothes again and only using this liquid from now on! I would definitely recommend for wearers of dark clothes and I think that it is reasonably priced compared to other brands that aren&apos;t as &apos;eco&apos; friendly! I will be buying from now on! I have to admit that I wasn&apos;t convinced about this product when I first saw it. When I saw that it was available to be requested to review I jumped at the chance to try my luck. 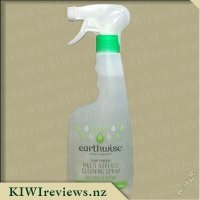 Upon receiving my box of goodies to review, I was pleasantly surprised to see the bottle of Earthwise Black Wash.
My eyes were drawn to the bottle by the contrasting of black writing and pictures on the light coloured bottle. The bottle also shows on the front label that this 1L bottle should do 33 washes, which means in my household it should last a fortnight which I feel is good value. At $8 for a litre it is more expensive than everyday liquid but I think that if it continues to provide good results then it is worth the cost. I opened the bottle and was pleased that it was easy to pour the liquid with no spillage. The liquid itself was a good consistency, not too thick and not too runny. 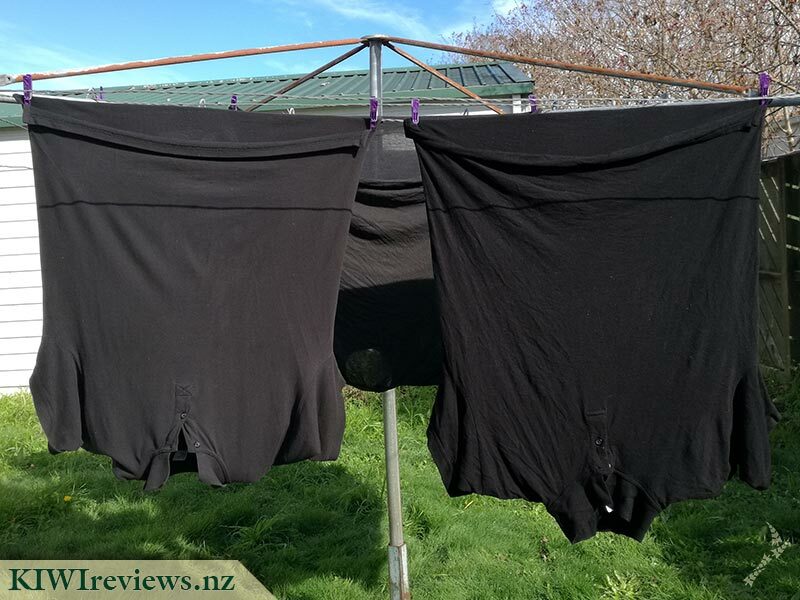 As a household that wears lots of black clothing I was keen to see if this worked as well as I had heard it did. My partner&apos;s work uniform is black and over time we have noticed it has now become that faded black/dark grey colour which is not ideal. My first load to try the Black Wash was for some black jeans and black shirts that had fluff and white marks from my partner&apos;s job. Usually when I use my normal liquid on clothes that have the white marks it seems to just stay on the clothes and I find myself either spot cleaning the marks or hand-washing the item again. I was pleasantly surprised to see when I hung the clothes on the line that this was not the case, they were in fact free of the white marks. I am eagerly awaiting purchasing some more black clothing to see how long they stay black without fading using this product. Using this liquid has also made me consider using the Earthwise Oxygenated Whitener to see if I can get similar results from my whites. 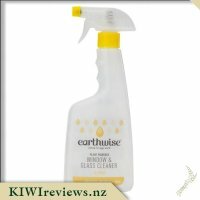 I recommend the Earthwise Black Wash to anyone that wears lots of black or dark clothing, and wants to keep it looking like it&apos;s original state. Earthwise is a great choice in household cleaners as they are natural, something I am very aware of with my children. I believe that I will continue to use this and it will become a usual purchase when we do our groceries. 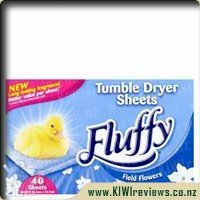 I use only sensitive washing powder for my family wash as I find all other laundry powders too overly scented and the fragrance makes me feel quite sick if I smell it on my clothes all day. 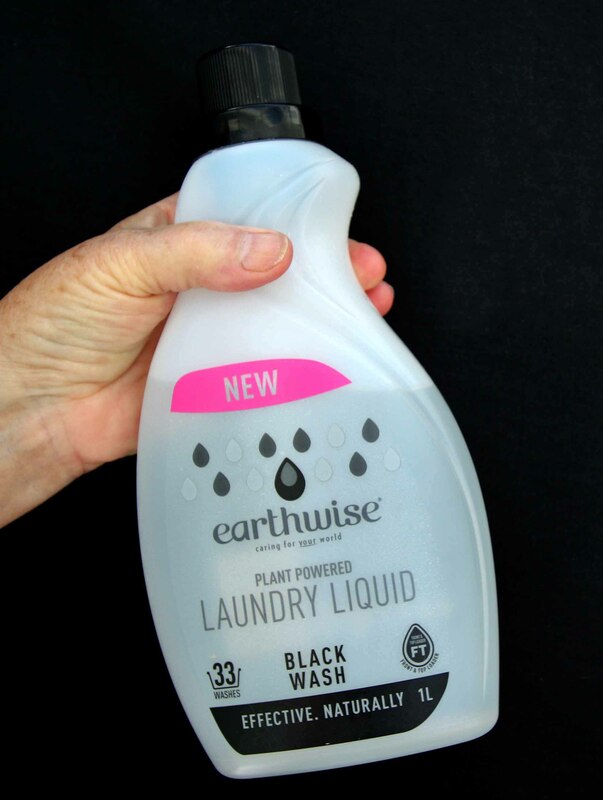 Earthwise produce good environmentally friendly products that in my experience are very effective so I was eager to try their Black Wash plant powered laundry liquid. This liquid promotes itself as being effective keeping your black clothes black instead of wash fading. Firstly let me say I do all the washing, hanging, drying, folding and ironing of the household clothing but I have never used a laundry liquid before. I have used (and ceased using) fabric softener in the past but never a washing liquid so this was a new experience for me. I read all the instructions and after deciding that I would be best to use the recommended dose of 30ml for a standard wash, I sorted my colours and added not quite a cup full to the wash. I noticed that the liquid had next to no scent and whilst most people would be disappointed with this, I wasn&apos;t; it was wonderful. When I checked my clothing load I was very happy with the quality of the washing, but I soon realised then that the effect of slowing down the process of black fading would be hard to gauge on old pre-washed clothing so over the course of the two week review period the only clear way to review would be on quality of washing. I am very happy to report after two weeks of using this product I would recommend to all for its cleaning powers and also for it being environmentally friendly and safe for septic tanks. I will continue to use in the future and I look forward to seeing this product on my local supermarket shelves. A two week period is a small amount of time to properly test a product that is meant to prevent colour fading over multiple washes, but I did the best that I could. 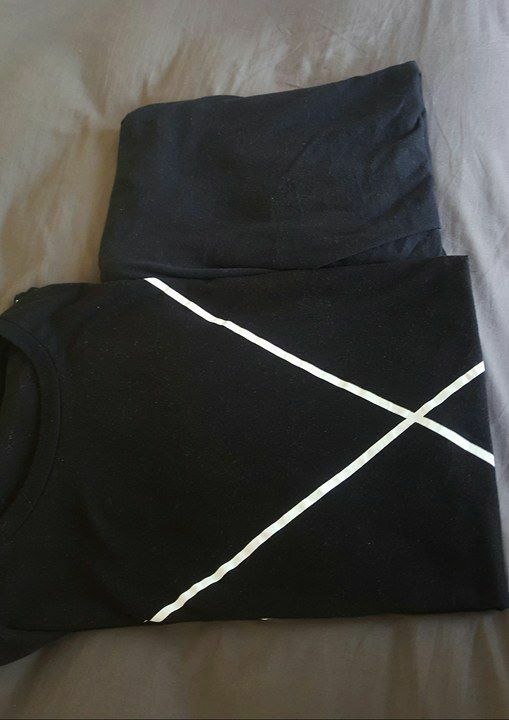 In the image you will see two garments; a black singlet (on top) that I purchased at a concert recently that was been washed maybe three times since purchase, and a t-shirt (with the "X")I purchased last week and have washed three times since. The singlet was washed with another Earthwise product, the Eucalyptus and Orange Laundry Powder, whereas the t-shirt was washed with the Earthwise Black Wash Laundry Liquid. Now, I am a lazy washer; the only things I separate are towels and other fluffy items, otherwise it all goes in the same load. Blacks, colours, and whites all get the same treatment. But as someone whose wardrobe is largely black (I go to a lot of rock concerts) it would be nice to have them last longer. The singlet after three washes has already shown significant fading when using the laundry powder, and now has more of a blue hue to the item. On the other hand, the t-shirt (while admitted in the photo looks very similar in colour) is still visibly darker. More testing is needed, but initial trials look positive that the product does reduce the level of fading (Note: the directions do recommend separating blacks from other coloured products, so results may have improved if I had done so, but that isn&apos;t how I do my washing due to the small amount I need to wash). The product comes in a large 1L bottle that provides an average of 33 washes. For myself, that would add up to around 17 weeks worth of laundry, so $8 is great value. The liquid itself is clear and viscous. The viscous (thick) nature of the liquid does make me question the accuracy of the expected dosage in the directions, as when you pour it in, much of the 30-45ml remains in the top unless you wait for a while for it all to drip out one drip at a time. Overall, it cleaned my soiled clothing, and seems to reduce fade in blacks. Requires small amounts per use, so very good value for money. Washing is the literal story of my life with a teenager and a 5 year old as well as a trio of animals I am forever washing clothes. I must admit that I do love black clothing and my teenage daughter has very little in her wardrobe that isn&apos;t black. Besides from the black clothing we also have a lot of other dark colours like navy blues and dark grey/charcoal and wash fade does annoy me. While seperating colours is a pain I love to keep my black clothes looking fresh and my white clothes looking clean. I have used Earthwise Oxygenated Whitener for a few years now for whites and anything that needs a bit of a deeper clean so this Black Wash is a perfect accompaniment for my laundry for my darker colours and I have loved using it. I have certainly noticed that my blacks are staying nice and dark. 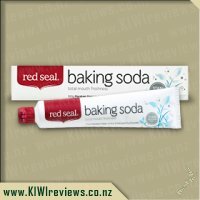 I loved the fragrance and the ease of using the liquid over a powder alternative, the bottle is easy to pour and measure out in my front loader machine so I really found it handy to use. I have been washing all our darks in this liquid and find they are coming out nice and bright and clean. With two white dogs and a lot of black clothing dog hair is a constant feature of my clothing but after washing you would no longer be able to tell they were once coated in white fur. I was impressed with the level of cleaning from this liquid and would use it regularly in my laundry to keep my darks looking dark. I find it is also good for my bright coloured clothes like reds and hot pinks which come out of the wash looking very bright in colour as lets face it sometimes you just don&apos;t have enough of each colour variety to do a black, a colour, and a white wash. There is nothing worst then buying a brand new black jersey/top or pants and have them fade after a couple of washes. Especially, when it comes to my girls clothing, I find I am having to buy them new clothes every couple of months due to fading. Black is such a versatile colour and goes with anything - it is really annoying when it turns to an off black and you really can not wear them in public anymore, instead they become &apos;home clothes&apos;. I have always &apos;meant&apos; to buy a black wash to see if it will extend my clothing/s life and I am so glad I got the opportunity to explore this product. I love the idea of having a black wash, so once I received it I have been separating my colours from my blacks/dark&apos;s/grey&apos;s and washing them separately in the wash. It is actually amazing how many black items we own as a family so was not hard getting full loads. 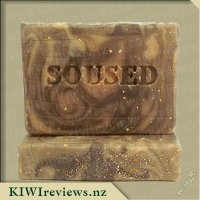 Although, as time is not on my side it is rather hard to truly judge how successful this product really is all I can say is the clothes were all nice and clean, appeared to still be the rich black they began as and they smelt yummy actually I really like the smell that it carries. I find a lot of our black clothing requires hanging on my special line instead of throwing in the dryer so I am hoping maybe the combination of washing them in this liquid and hanging will help prolong their life some. I found the packaging to be perfectly fine to read and I have to say I did find it rather funny how it was all black, grey or clear (besides the splash of pink) as to reconfirm there point. I found it eye grabbing and straight to the point. I also appreciate that it is for front and top loader washing machines, as we have a front washer sometimes we get excluded. Like all Earthwise products there is the spill about what they stand for and also that is is grey water and septic tank safe which makes you feel that much better for using it. I don&apos;t mind the price at all, as it states that it should do about 33 washes which works out roughly around .24 cents a wash which to me sounds very reasonable. I have already used it about six times in the period I have had it so it has been very handy. I am keen to see how the jerseys I have only recently purchased last with this laundry liquid and will depend on the richness of the colour as to if I will continue to buy. At this stage I can confirm I am impressed. What a wonderful idea! I have many more black and dark coloured garments than whites or pastels, and fading and streaking is often an issue with ordinary washing powders and liquids - even the "better" brands - and believe me, I have tried most of them. Apart from clothing, I also have several sets of dark coloured sheets (black included) and some dark cushion covers which need frequent washing as the cats insist on sitting on them and decorating them with discarded fur. I have seen "Black Wash" advertised but never knew exactly what it was until I was given this one to review. I was out of washing powder so made the decision to try it, not just on the darker items, but also on the lighter ones as I figured it would not hurt them. I had three wash loads to do: one whites, one darks, and one mixed colours. I was taken by the smell as I added the liquid to the first load. It reminded me of that elusive scent of freshly washed laundry that you get in hospitals and hotels - the clean, woodsy, no frills effect that engenders confidence that the linen is going to be really clean. No artificial smells as far as I could tell; just honest freshness that you feel you can trust. The first load was the whites. I checked for streaking and detergent residue but could not fault the items. I have a cold wash only machine - and the label actually specifies that a cold wash is best - so it is important that the rinse cycle works properly with the detergent. The second load, the mixed colours, was just as successful with the added bonus that the muddy socks emerged beautifully clean. And then the test load - two black sheets, a black t-shirt, and a navy shirt. They emerged perfectly clean much to my delight. I tried to take a photo, but the black sheet was so black that you could not actually tell what it was! I would suggest one slight improvement on the packaging. The quantity to use is shown in the form of a graphic, but it is very small and the dosage in ml is printed on a shaded area - difficult to see if you are visually challenged or if (as I was) you are working in an outside washhouse with dim lighting. The size of the pack should make it easy to include a bigger graphic as there is plenty of room to put it. The first time I used the detergent I had to take an educated guess as to the quantity needed. I was right, but it was more by luck than by anything else. 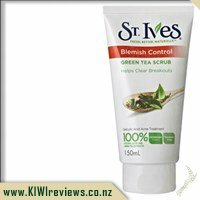 Although the price of this product is in the medium range, it is good value. Buying cheap can mean you end up with an inferior product which can just end up costing you more. However, I will probably purchase a normal Earthwise laundry detergent for my lighter coloured washing and save the Black Wash for the purpose it was intended for. It is reassuring to see that all the Earthwise detergents are grey water and septic tank friendly because my washing machine empties into an old fashioned country soakaway, not a piped drain, so it means I am not polluting my own land.